Week 49: Pop Up, painting and an exhibition. Some great things to buy from the small and inexpensive to larger works of art. 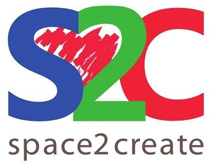 Support Space2Create, South Lakeland Mind and Creative Arts by buying something hand made or making a donation. In 2Create, we learnt about the famous Mexican artist Frida Kahlo, who began painting whilst recovering from a serious accident. Using her bold, bright style, together with inspiration from another artist called Heather Galler, we all began our own attempts at creating a vibrant, primitive piece. Many of the works produced are still in progress, but it proved a thoroughly relaxed, enjoyable and creative session. On the ward, we experimented with torn images, and completing them in various media. Using images sourced from magazines, we tore them roughly in half and then drew or shaded the rest of the image outline (and/or internal detailing) using pen or pastels, adding a few flourishes of our own here and there. The results were eye-catching, interesting and varied. In the session a few different activities were going on. One person had drawn out comic style Christmas Card and was making more. Some of the group were making handmade miniature books from wrapping paper for the covers and with blank pages. Another person was knitting. A enjoyable session as staff also started getting ready for the Open Studio weekend on the 13th and 14th December. This session saw the group finishing off from last week. We l;ooked again at how lines could be given more depth and character by thickening and rounding corners. Some were rag rugging, some drawing comics and some working on their own projects. We also popped round to Unit 26a to the Millyard Studio exhibition which was excellent.